Firewall as a Service (FWaaS) Market size was estimated at over USD 500 million in 2016 with a CAGR of over 25% from 2017 to 2024. Rising adoption of BYOD and cloud, expansion of business applications, changes in the network security environment, and increased investment to improve security are some of the factors propelling the firewall as a service market growth. The rapid increase in the cyber-attacks, digital payments, and privacy concerns has led to encouraging administrative regulations among industries, resulting in the high adoption of firewalls. Moreover, with the increase in the bandwidth firewalls need to work faster. The technologies being used has increased the firewall capability of inspecting more intelligently, paving the way for the use of web filtering, DLP, and VPN. Thus, the use of cloud is gaining importance as organizations find it difficult to manage stand-alone network components for security deployment due to budget constraints. Also, the recent instances of organizations being punished for not securing their customer information and regulations imposed by government will foster the market growth. However, budget constraints and slow rate of adoption of technologies in developing economies are likely to restrain the firewall as a service market growth. 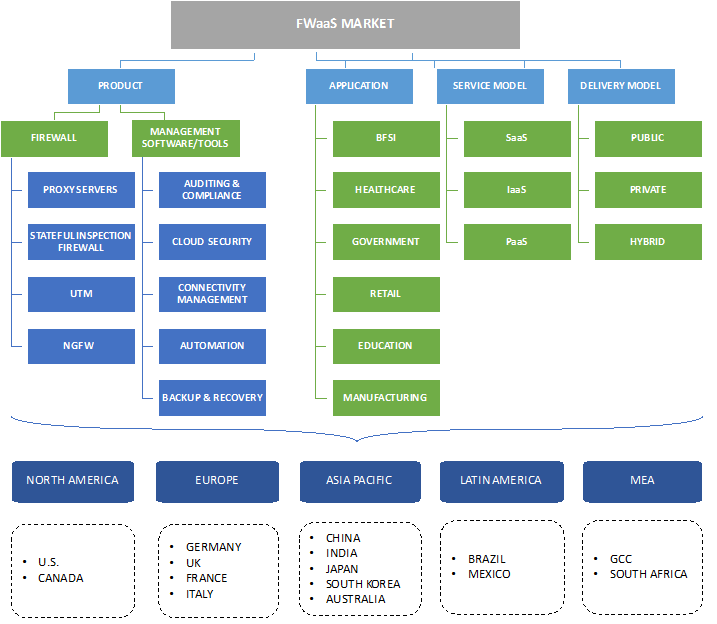 The industry is still in its initial stage as providers have just started the concept of service in firewall solutions. 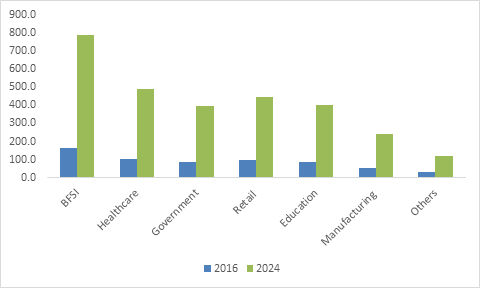 The firewall market is anticipated to dominate the global revenue with a share of over 50% in 2024 owing to the high adoption by firewall appliances by large enterprises. Emphasis on regulatory norms and reduction of cybercrimes is further contributing to the industry growth. NGFW will dominate the firewall market due to its multifunctional security capabilities and expected to gain market share in the growing SME industry. The firewall management software market is majorly driven by need of monitoring policy compliance, optimizing firewall, and eliminating downtime due to misconfigured firewalls. Enterprises are putting more effort on improving cloud security and automation of firewalls as the end-users are ready to invest and reduce the cybercrimes. The BFSI segment is anticipated to exhibit high growth of over 22% CAGR from 2017 to 2024. With the modernization and development, the use of technology has gained momentum. Moreover, the number and impact of cyber incidents has increased in recent past two to three years, more in the case of financial institutions that needs to put security framework to ensure adequate security preparedness among banks. Also, growth is improving due to the use of digital banking, regulatory compliance, and improved business performance. Government offices are expected to experience high growth owing to an increase in the number of threats causing billions of dollars loss is driving the firewall as a service market. Moreover, government agencies are working with security providers to come up with customized solutions to track the cybercrimes. It is expected that globally, the expenditure on vital intelligence and cybersecurity ventures project will cost more than USD 1 trillion between 2016 and 2020. The public delivery model will dominate the market in 2024 owing to high adoption by SMEs. As most of the public firewalls offer little on security of the configuration tools, developments are being made to overcome the development of rule set in the cloud. Currently, most of the vendors are trying to simplify firewall management software and work on public cloud to attract more number of customers. However, with the changing market scenario, customers are expected to adopt private and hybrid delivery model due to higher security features. The hybrid model is anticipated to grow due to the increase in awareness about the high efficiency to be achieved, rising volume of data, and implementation of IoT and big data. The SaaS model is expected to witness substantial growth over the forecasted years due to the increase in SaaS applications by enterprises. As the model is quite advantageous to smart-ups and e-commerce companies, the growth will improve as it reduces the cost of ownership and removes the need for technical staff to manage, and update. The PaaS market will have a growth as the model automates customized platform stack, meeting different application requirements and working on-demand basis. The firewall as a service market is competitive as majority of the players are firewall appliance providers, trying to integrate with cloud companies to offer their products to a wider range of customers. Also, the market is changing with the entry of management software providers, trying to capture the firewall appliance providers market and creating new management software market. The companies operating in the firewall as a service market include Checkpoint, Palo Alto Networks, Fortinet, Cisco, IBM, Symantec, McAfee, and Sophos. Additionally, some of the pure management software providers holding strong place in the market are Tufin, Firemon, Algosec, Skybox Security FireEye, and Watchguard. FWaaS is a firewall delivered as cloud-based allowing customers to partially or fully move the security inspection to a cloud infrastructure. The players operating in the industry are concentrating on development of the advanced management solutions to meet the customer demand. With the increase in the usage of cloud computing, the market is quite attractive for cloud & managed service providers, integrator, firewall appliances, and management tools vendors. Vendors are collaborating with software vendors to create a customized solution while enhancing the efficiency of business applications.